* Quiet, powerful, liquid-cooled engine fueled by natural gas or LP gas. 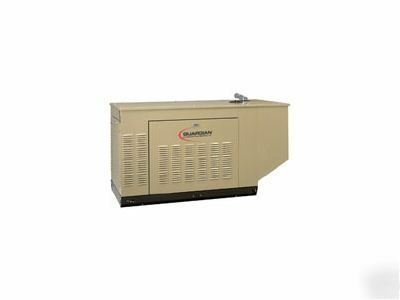 * A standard weather protective enclosure protects generator from harmful weather and also reduces exterior noise levels. Includes key locks for security. * Built-in charger maintains battery at optimum performance level. * Automatic safety shutdowns protect engine and generator in event of low oil pressure, high temperature, overspeed and/or overcrank. * Automatic seven-day exerciser runs the system for fifteen minutes each week to maintain top running condition. * Standard 100-amp remote-mounted automatic transfer switch for fast and efficient unattended transfer to generator when utility source fails. Transfer switch sold seperately.